We will not be focused here how backup should be used in which case, since it depends on the size of the environment and the time required to recover the data from a backup. or granular backup using to recover from a backup, a single mailbox or emails that are in the mailbox. Below we present a sample configuration backup of Microsoft Exchange 2010 SP2, which consists of a DAG containing two servers with the Mailbox role. To backup Exchange Server we will use backup tool Symantec NetBackup 7.5. At each of the Exchange servers must be NetBackup client installed. If you want to configure a Granular Recovery for a backup we need to install NFS role on each Exchange server with CAS or Mailbox role. When configuring a backup Granular Recovery (ability to recover a single mailbox), for each of the CAS and MBX servers need to install NFS role. Before installing this role, we need to make sure that the service ONC/RPC Portmapper is disabled on the server. To do this, log on to the server, run services.msc and find the service ONC/RPC Portmapper. If you find this service, you need to stop it and set the Startup Type – Disabled. This service usually occurs on servers with the Mailbox role. Then on the Exchange server run Server Manager console and select Add Role Services for Network File System if it is not installed. In addition, in the event we need to backup individual mailboxes we need to change service Netbackup Client Services properties. To do this, open the properties of the NetBackup Client Services and go to the Log On tab, where you enter user credentials belonging to the Exchange Organization Administrators group or have rights to all mailboxes. On the backups server, run the console backup NetBackup Administration Console, where you create a new policy called Exchange_test, as shown below. If you want to perform a granular recovery backup select the appropriate checkbox Granular Enable granular recovery. 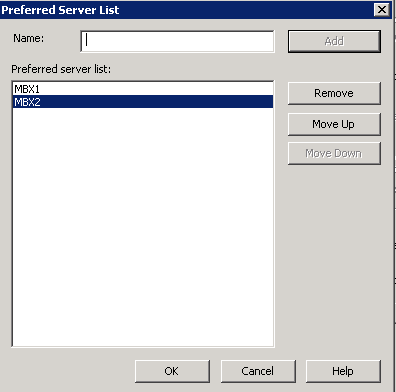 Then select the Preferred server lists … and enter where both servers belong to DAG. Go to the Backup Selections tab, where you need to choose exchange databases to backup. Backup Schedule must be adapted to take account of individual environment, so we skip this step. When you create a policy we have to wait until it is done automatically, or to verify the policy correctness, we can run it manually. Tagged Backup, Exchange 2010 backup, Exchange Backup, Exchange Granular Backup, Symantec Netbackup. Bookmark the permalink.